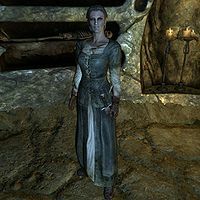 The Coldhearted Gravedigger is a Nord warrior who may appear in the Hall of the Dead in Windhelm during the quest The Dark Brotherhood Forever. She is one of ten possible targets. She may tell you, "I'm dying for a rest. I swear, I could lie down right now, and just sleep forever." The Gravedigger wears farm clothes along with a pair of boots and a pair of gloves. She wields an iron dagger in combat. The Dark Brotherhood Forever: Yet another child has prayed to their mother. This page was last modified on 17 March 2014, at 15:43.